You’ve had a great night with friends. You’ve been sitting around talking, while having some appies and glasses of wine. Before you know it, it’s the wee hours of the morning. You’re too tired to clean things up, so you just leave everything, including the wine glasses. By the time you get around to cleaning them, the wine residue has dried, and they’re looking a little worse for wear. So, what’s the best way to get these glasses sparkling again? The dishwasher method is gaining ground on hand washing purists. 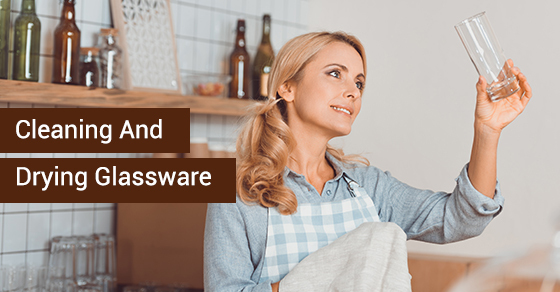 There have been many advances in dishwasher technology, and glass manufacturers are now making glass stems much more sturdy and likely to survive a trip to the dishwasher. It’s best to leave the hand washing for any traditional crystal like Waterford or Stuart. Those glasses could suffer in the dishwasher. If you have looked into any home cleaning packages lately, perhaps one of the things you could ask about is having your crystalware washed. Even with the advances of dishwashers, wine enthusiasts often choose to hand wash their wine glasses. If you do opt to hand wash your wine glasses, or any other delicate glassware, you really should have the proper tools. Some bottle brushes might do the trick. Try to find one with gentle bristles that could squeeze into any shaped glass. As for using dish soap, look for a mild one without any heavy fragrances. Purists would say to use just hot water, but often that is not enough to rid glasses of residue. If you choose to dry your glassware, you should try to find a towel that won’t leave fuzzies on the glasses. Old school towels, often called sack towels, are a good choice. Microfiber cloths also do a good job and dry quickly. Whatever you do, don’t let water spot dry on your glasses, because it may cause permanent blemishes. Use about one tablespoon of bleach in a gallon of warm water to sterilize the glasses after washing, and rinse well. Companies who offer home cleaning packages may have more helpful hints like these for cleaning those more delicate items in your home. Giving them a call to see what they have to offer could save you time and trouble.